In 1849 Joachim Heinrich Hoklas arrived in Port Adelaide in South Australia on the ship “Australia”. He was part of a group of people who emigrated from the Mecklenburg area of Germany and eventually arrived at New Mecklenburg (now Gomersal) in the Barossa Valley in 1855. In 1860 Joachim purchased a property at New Mecklenburg which has been owned by the Hoklas family ever since. Our vineyard is situated on this property. In the late 1800’s a cellar/barn was built on the property which features an underground cellar with an arched ceiling and an upper level with a slate floor. A vineyard was known to exist on the property in the 1890’s but was removed in the 1900’s. Vines planted by Dean (5th generation), Julie, and their sons Caleb & Isaac in 2001 have been trained and pruned by the family and handpicked by family and friends. The first grapes were harvested in 2004. The vines being only 3 years old produced low yield high quality fruit. The vineyard is being managed to produce approx 5 tonne of grapes per hectare. This low yield philosophy produces high quality single vineyard wines. All family members assist with the vineyard and Dean who has over 15 years experience in wine manufacturing attends to the winery duties and bottling schedules. 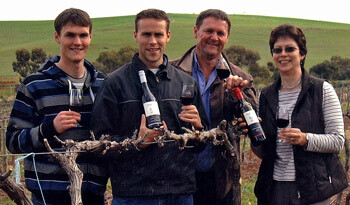 Hoklas Family Vineyards intends to continue to hand prune the vines, hand pick the fruit from low yielding vines and produce premium full bodied Barossa Style Red Wine.